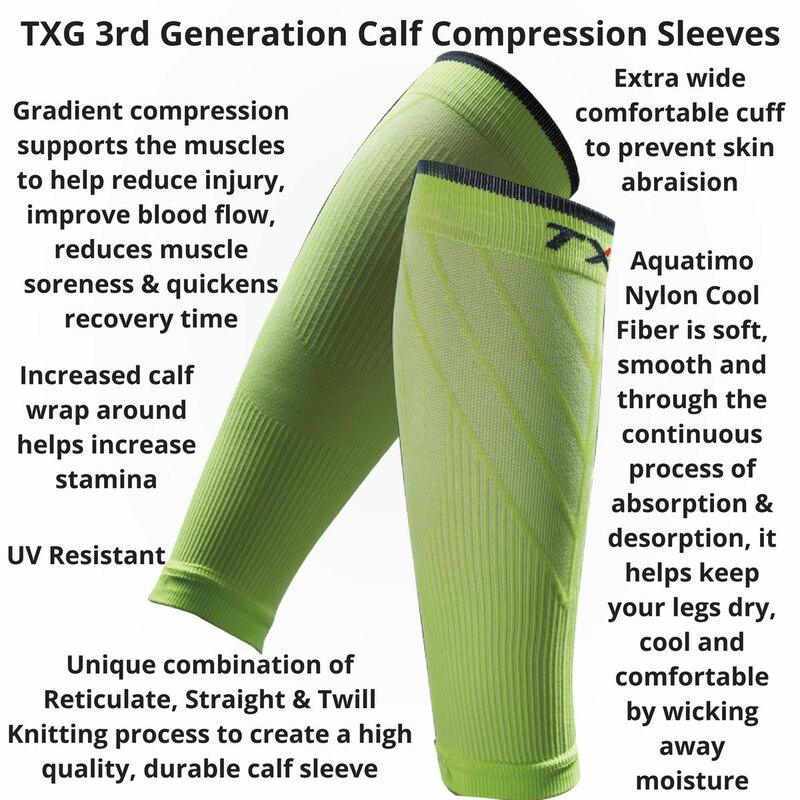 TXG Calf Compression Sleeves are also known to many as Compression Leg Sleeves or Calf Sleeves. We’ve made them from Aquatimo® (Nylon Cool Fibre) material, which is a unique textile that remains smooth to the touch while transferring heat and absorbing moisture, keeping you cool, dry and comfortable. This means you can wear it underneath your usual training outfits for an added edge. Our Compression Sleeves are great for flushing lactic acid build up from your lower legs and aiding in your body’s lymphatic pumping action. Together, this relieves aches, swelling and tension in the legs while preventing Deep Vein Thrombosis (DVT) from developing and treating existing oedema conditions. This is in addition to its usual benefits of improved circulation and energy levels as well as reduced tissue damage and muscle stress. Aquatimo® (Nylon Cool Fiber) is an innovative textile technology developed by the TTRI (Taiwan Textile Research Institute) through which nylon fibers are modified to become hydrophilic nylon.This process creates the Aquatimo ® fibers which have a soft, smooth texture and high heat transfer ability, they are able to rapidly absorb and release moisture which keeps your skin feeling dry, cool, non-sticky and comfortable. 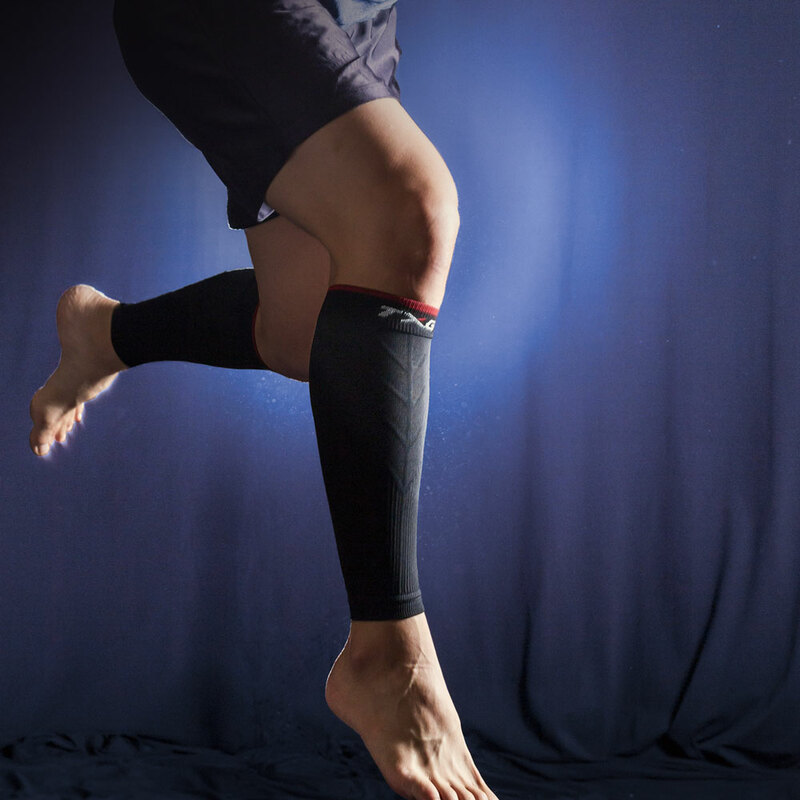 Ready to experience the benefits of TXG Calf Compression Sleeves, for yourself? These Calf Sleeves (sometimes called Compression Leg Sleeves) are perfect for you if you’re looking for an affordable yet comfortable calf sleeve that will give you all the benefits of graduated compression and reduce recovery time between sporting sessions. Simply choose your size, colour and add to cart at the top of the page to have your TXG Compression Calf Sleeves delivered to you anywhere in New Zealand with our free 7-day standard delivery, or you can upgrade to Express 2 to 3-day delivery for just $5.99. Rural deliveries take an additional 2 to 3 working days. My Calf Sleeves help with my running. They are a nice fit and comfortable to wear. I’d recommend them. Great trader and excellent product! Thanks for your service this product is incredible I’ve never worn anything like this product before. I’ve had them on for a few hours now and I can feel a difference already. The information booklet that came was VERY helpful and I’ll definitely be purchaseing more of these in the near future. Just a random observation about the calf sleeves.I have been running/racing with your calf sleeves for the last 20 months or so and have found them to be the best that I have tried. I have managed to stay injury free during this time, some of which I think is definitely attributable to the sleeves. I think they are a great product but they are basically anonymous as they dont have any obvious branding, at least on the black ones. Have you thought about putting your logo on them (Large white letters on the back) so that other runners can see your product is out there? 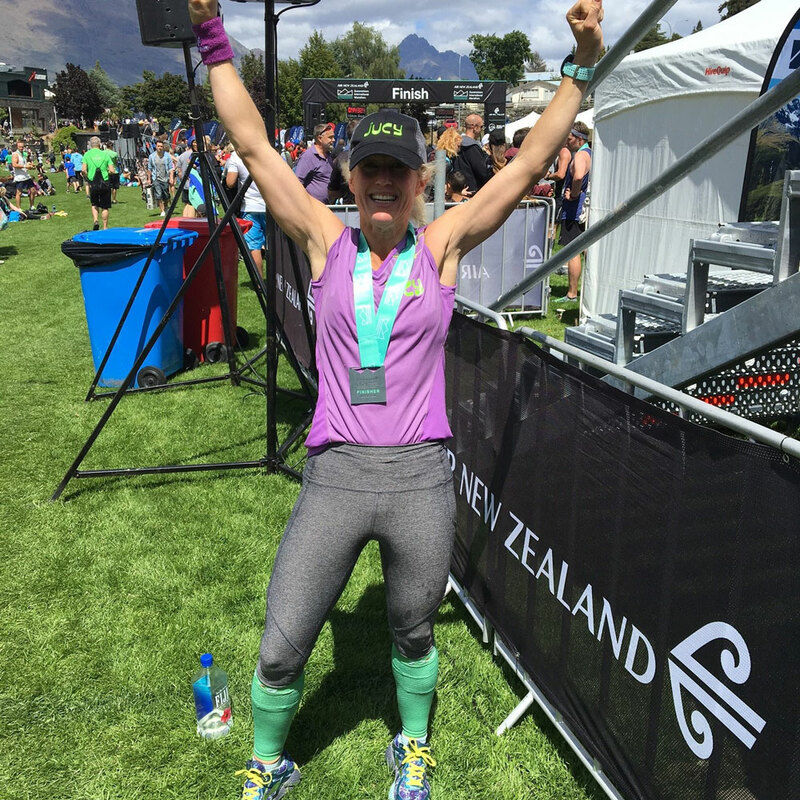 I have a couple of races in the next 6 months (Taupo 74km and Tarawera 100 km) and I will definitely be wearing them with or without the logo! Quick note to let you know that I received the compression sleeves and WOW. I am not only impressed by the quality of the product but also your level of personalisation and attention to detail. I will definitely be recommending you and i’ll be back for more in the future I am sure! Thanks they arrived today. My Husband is delighted with them. You really go the extra mile with your customer service. I am in rehab for a torn Calf. With my Calf Sleeves I am able to run while still recoving from my injury. I’d recommend them as they are high quality. What a pleasure to deal with. Fantastic quick service and excellent buy. Super highly recommended!! My compression sleeves have arrived safe and sound. I’ve only had them on for an hour and can see how they’ll benefit my ailing calves from now on. Thanks again. They will most definitely be worn during as well as post exercise from now on. I had a calf injury and was looking for support. It is brilliant to be able to run again. I would recommend the calf sleeves as they worked for me. The compression calf sleeves arrived and they are exactly what I expected. I have done a couple of runs with them on and they are brilliant. What I didn’t expect was the personalised messaging with my delivery. That really was the cherry on top. I would like to purchase two more pair. Product matches description so no surprises. I work in a lab and I stand on my feet most of the day and my right calf was getting sore. After wearing the sleeves for a day I didn’t feel any pain in my calf. The next day I thought I’ll try not wearing them and the pain came back. If I knew someone having the same problem as me I would totally recommend TXG, the products are great and the customer service was great too. I was trying to find a top quality reputable product that truly did the job. I purchased the calf sleeves as I had very bad shin splints. I wore them firstly to help with my recovery and then while running. I had immediate relief from the first time I wore them. Running with them is fabulous (they stay up. I was worried they may slip down) They make running far more comfortable now. I would absolutely recommend TXG calf compression sleeves The product is first class – does exactly what you want/need it to do and it’s very well priced. But more than that – the level of customer service from Heather makes the whole process exceptional. The little details that she goes to the trouble to include make your day! My recommendation is to keep Heather on! Give her a bonus! I hope all your staff are trained to give the same first class customer service as Heather to match your first class products. I had sore veins on my leg from working on my feet 8+ hours a day. After wearing the calf sleeves my legs/veins are not as sore – they don’t ache as much after work and I sleep better at night. I would absolutely recommend them to others I have told my work colleagues already. Great Service and high quality product. I just had to email your team to say a big thank you! You have made all of us here smile with your packaging, wee notes and then the chirpy email to follow. Yes, we have the calf sleeves and they will be a very close friend to two very niggly shins and will definitely make one teenagers life better, so thank you very much. I found the compression calf sleeves reduced the discomfort of my aching legs/veins. I would recommend them – they are a reasonable price – very high quality – great service and prompt delivery. My calf compression sleeves give my legs support during workouts – especially during cycling I feel more confident to get enough km done. 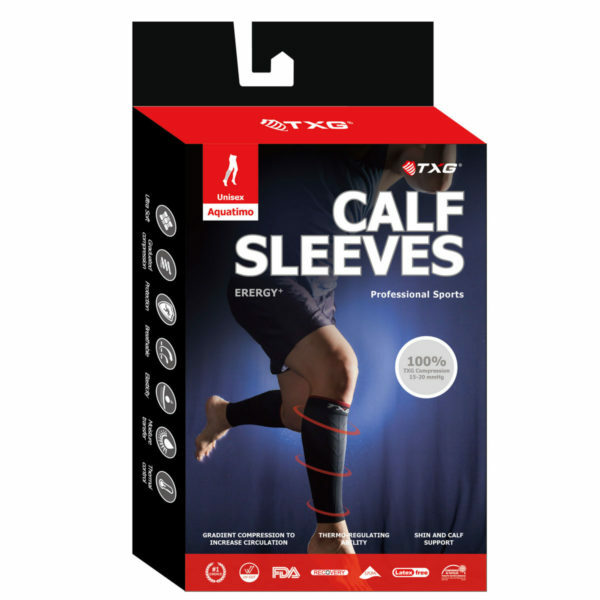 I would recommend the TXG calf sleeves – they are a good product – easy to put on and off as well and very high quality. Friendly service and nice communications. The calf sleeves arrived today. They looked like a very late christmas present with a bow – card and a gift. I was flabbergasted! Thank you and your team so much for the special effort you are making when sending out goods! It is thoroughly appreciated. I also like the story how your company works – well done! So far so good – the calf compression sleeves keeps my calf muscles (which are always susceptible to breaking down) intact when running. I would certainly recommend them as the sleeves are very high quality and your service is exceptional. Your communications are great. We found that we had tight calf muscles after longer training runs. 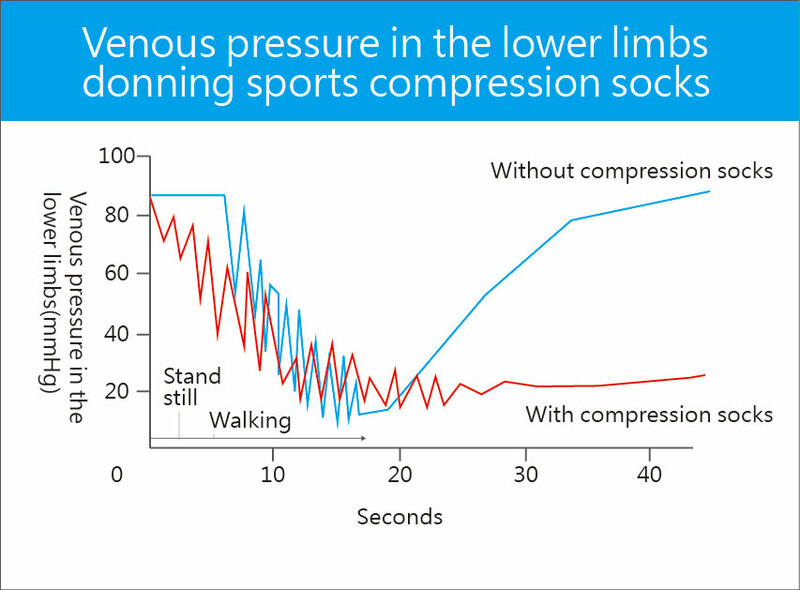 Wearing the compression calf sleeves we found less fatigue and less soreness after running. We also wore them on a long haul flight and didn’t get swollen feet. We would definitely recommend the calf sleeves – they are good value for money – are high quality – they wash well and they do what they should. There are some loose threads on the inside of the calf sleeves but this is not a big deal. We have received fantastic customer service. Me and my husband have both been wearing the calf sleeves for longer training runs and they are fantastic. I bought the calf compression sleeves because they were the best value for me. I use them for injury prevention and they seem to be doing a good job for me. I would recommend them. Service is good. My problem was a deep compartment within my calf muscles. The benefit I found was that the calf compression sleeves trapped heat to help ease my calf muscles while playing sport. I definitely recommend them. The material is thick and very high quality which is what I needed. These calf sleeves can be used for a range of things. Customer service is 100% amazing very lovely people! No need to improve anything. My main challenge was finding the right level of compression. Other brands lost compression over time. 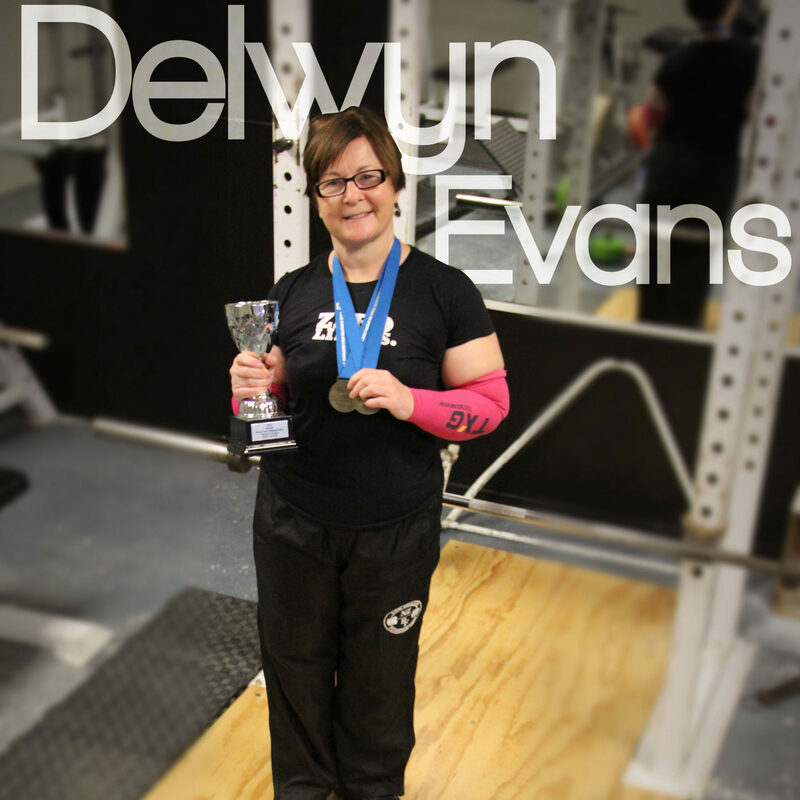 I have had no calf tears since I started wearing my calf compression sleeves. I would recommend them as they are great quality. My sleeves arrived very fast! I’ve never received such carefully packed sleeves; it was quite the experience. Thanks. 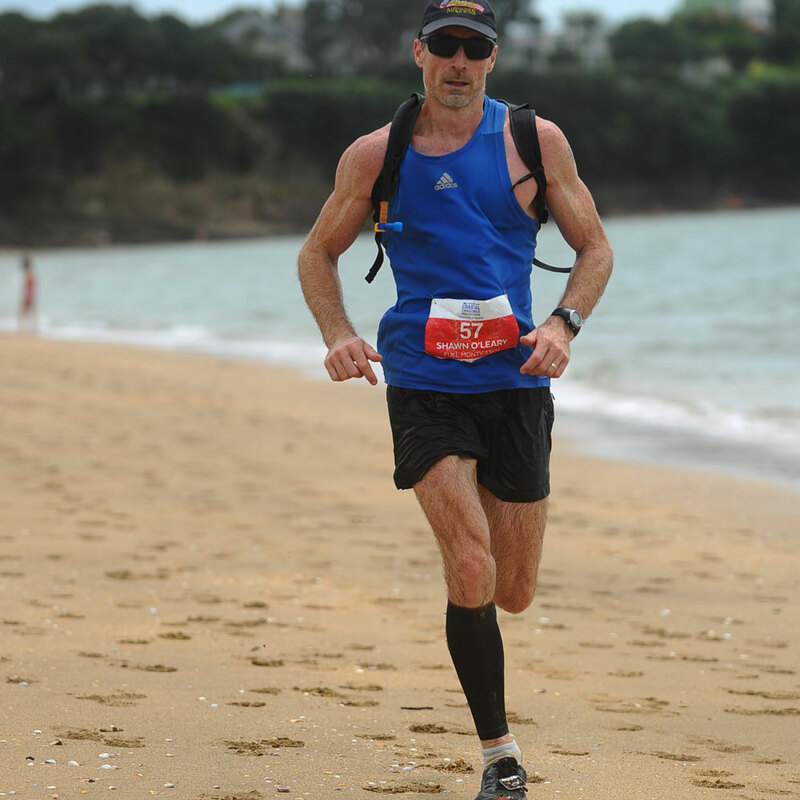 As an injury prone 50+ runner I was looking for calf support sleeves whilts training for the Buller Gorge Marathon. 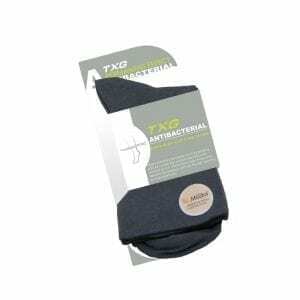 The TXG sleeves are well made, good value and have firm compression. They definitely help reduce calf soreness after exercise and post warm up help to keep my calves warm and supple. I recommend them because they are good quality and good price. Great Customer service! The calf sleeves has eased my pain from shin splints and better recovery. I love the calf sleeves that I got. It was recommended to my by my physio to start running in calf compressions due to multiple calf and achilles injuries. I use them to be able to run for longer periods as I’m a heavier guy training for Ironman and need all the help I can get. My biggest problem is overheating, I’ve never liked wearing anything other than the necessary things when training due to overheating. I feel that the TXG calf sleeves are a lot more breathable than my canterbury sleeves. With them feeling a lot more breathable it feels like I;m not wearing them which is a huge bonus. The benefits I found were the comfort and knowing that I’m wearing something that are doing exactly what I need them to do. I have already recommended TXG to my circle of keen mates and I’m going to get my mum some socks for her birthday. I am a tradesman business co-owner and operator so I believe that being honest and your service/product does and offers exactly what you say it does is all you can do. I believe you have a great product and I enjoy the personal touch you get when you receive your order so no complaints from me. Thanks once again for the great service and product. Hello Heather and TXG team, Thank you for an amazing products. The features I like about txg compression products are quality and comfort. I have been wearing txg calf sleeves when walking and joking for a period of times. Also wore the compression socks while travelling on a long haul flight. I say goodbye to the heavy legs and swollen feet and ankle after a long walk and a long flight because of txg compression socks, yeahhh..!!!!. I recommended a various type of products TXG offers to my family and hope they could find the right one for them and enjoy the benefit as I do (especially, the superb customer service that always bring a smile to your face). The race went very well, and I loved the sleeves! I think I sold a few pairs for you as I got a few mentions! I’d like to buy another pair. Here is a quick update to let you know I was delighted with my compression sleeves, when I wore them for the first time on the Old Ghost Road tramp last month. No swollen ankles and lower legs! After my December tramp last year, it took a couple of weeks for the swelling to resolve, so great not to have that this time. I did appreciate the care and attention my order received. The quote you included “Make today so awesome that yesterday gets jealous” remains on my desk for daily inspiration… and means I think of you each day! Thanks for the delivery of my recent purchase, compression sleeves. I have used them and feel some benefits from them, value for money when compared to other similar products available in the market. The service with the order was good. Thanks Heather, they’ve arrived and feel great! Thanks, they’ve arrived and feel great! After wearing my TXG calf sleeves all day with a lot of standing around there was no or very little swelling in the foot and ankles. I am very pleased with them. Have tried other so called compression wear and yours are the only ones that actually work. Well done. I ordered my first pair a few weeks ago. They are fantastic and the service you provide is very friendly and has he personal touch that many modern companies lack. So thank you and I will be back to order more. Been wearing the TXG compression calf sleeves for a few weeks now when running and they are the best compression gear I have used. They are comfortable, stay in place and work. Since I started using TXG my right calf muscle, which has always given me trouble when running is now improving and I hardly notice it at all now. Thanks TXG. I practice and teach Ashtanga Yoga 6 days a week. The TXG Compression Calf Sleeves have provided much needed support through my lower leg muscles and particularly my shin bones. I suffer from poor blood circulation during the winter months. I started using the calf sleeves during my yoga practice and experienced improved blood flow, resulting in better performance and faster recovery. I have experienced deeper levels of mobility in my ankle joints as the shin bone is warmed improving vascular performance. The TXG compression fabric comforts and fortifies the muscles and tendons in my lower legs while reducing inflammation, swelling and soreness. I use the calf sleeves when I teach and travel. My shin bones are thanking me for the support. Received my TXG Calf Sleeves today. Excellent service I must say. Easy to order, fast delivery and a great product, thanks Heather. So I’ve been impressed enough with the product to want another pair. My compression sleeves arrived today one day after ordering. I am very impressed with your service along with the package presentation. You are obviously very proud of your customer service and your product. I have now opened an account with you and will definitely recommend your service and product to my family and friends. I received my calf sleeves the very next day, thank you so much. I put them straight on and told my partner they mad me want to run haha. Very intrigued about the gift, yet to be opened of course, my family have been trying to get me to open it before the 5th June, but I said that you are such a fab company to deal with I couldn’t possibly open it before and let you down. Just to let you know I’m going to sing your praises from the rooftops (actually at our gym that focuses on running) they are all always eager to find value for money products and new companies that have such friendly and approachable staff. I would recommend this product to any one that gets sore calves and achilles from running, as they have been an awesome help to me. I am loving the calf sleeves for training and they were an awesome price. My calf sleeves are great, love them so much I’ll probably be ordering another pair in the next few weeks. Thank you very much for my calf sleeves. The card is a great surprise and I am now anxiously waiting for next Wednesday! I will definitely be buying form your company again. I am extremely pleased with my calf sleeves, have been umming and ahhing for a while whether to try some to try and stop my calves from getting so tight after running, and I do think they are making a difference. An unexpected benefit, which I don’t want repeated, was my second run with them on, I got attacked by a dog who took a bit of my calf (mustn’t have liked the colour! ), I really think the sleeve stopped the bite from being too bad and it certainly prevented it from bleeding too much, because once I got back to the car and rolled down the sleeve the blood started pouring out. Although I was not happy with having a hole in my new calf sleeve? At least the blood washed out okay. Anyway I think my partner is keen to get some calf sleeves or socks so probably be putting another order in soon and I will probably get another pair too. So, thank you again, especially for the prompt delivery, couldn’t believe how quickly we got them. Great service. I am very happy with my TXG calf sleeves. One big plus is that when sitting in a car on the way home after a day tramp my lower leg and foot does not “go to sleep” as it regularly did before. My leg also doesn’t feel heavy when walking. All other products that I had tried failed to reduce the swelling and some were a lot more expensive than yours. 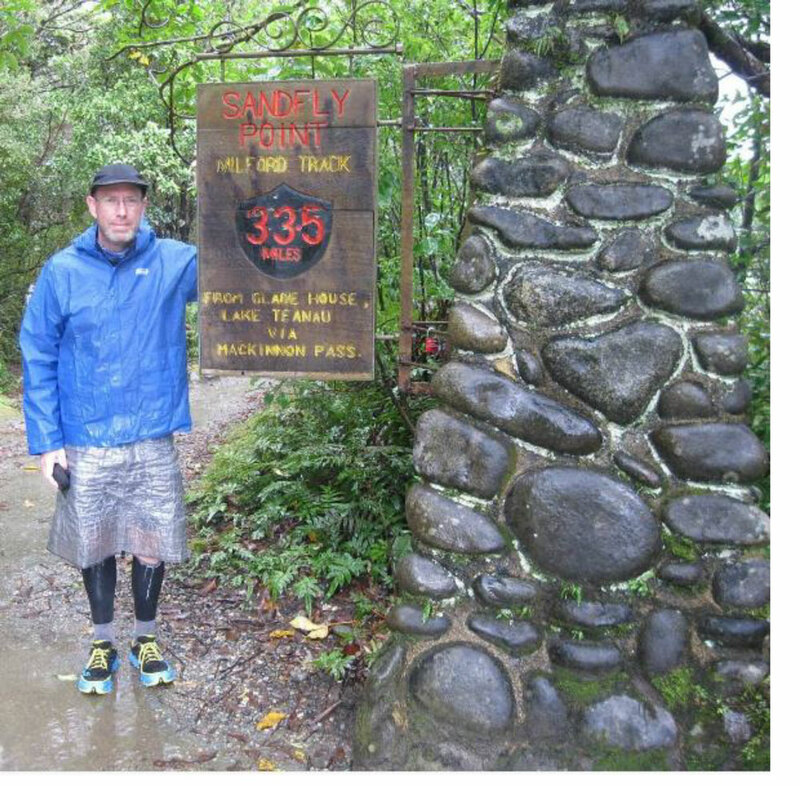 The walkie talkies started our training for our 100km walk for Oxfam, we tramped up Mt Holdsworth to Powell Hutt (Waiarapa) and our TXG socks were amazing? Warm & Comfy and held our legs together through rain, sun and snow!! !